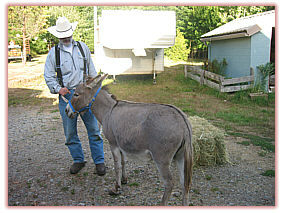 Miniature horses (and mules and donkeys) are gaining in popularity. Because of their often "roundish" body size and no one is riding them to notice bitting or performance problems, often the condition of their mouths go unnoticed or overlooked. Crowding of the teeth in a miniature's head is a common finding. "Mini's" have "full" sized teeth in a "subcompact" sized head. Misalignments and periodontal pocketing are not uncommon. These pockets trap feed, the feed undergoes necrosis (rots), the rotten feed creates painful gum infections and diseased tissue that leads to loss of supportive structure for the tooth. The end result is the loss of the tooth, or more appropriately, a necessary, often expensive extraction. 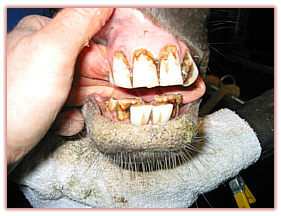 The infection that is associated with periodontal pocketing is painful and it subtly adversely affects the overall health, attitude and energy of the horse. Treating periodontitis involves balancing the malocclusions ("leveling the teeth"), cleaning out and medicating the infected areas and sometimes extracting the overcrowded teeth that have caused the problem. "Wouldn't I know if my horse is having problems like this?" Seems like the obvious answer would be "yes." Unfortunately, most of the time, this is not the case. An obvious chewing problem or a foul odor from the mouth might indicate problems in an advanced case but most of these problems are much easier to deal with when found on a thorough oral exam early on. It is very important to have a professional examination done early in the miniature's life. 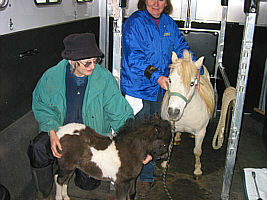 If a miniature's mouth is monitored from 6 months through 5 years, often (depending on what the mouth looks like), with potential crowding noted, radiographs taken to note how the teeth are coming in, extractions to make room for other teeth, the miniature horses will mature into adulthood with a healthy, attractive, pain free mouth. If you've acquired a mini as an adult and missed the opportunity to start dental check ups at an early age, consider the sooner the horse IS evaluated, the better. Problems don't go away on their own; they just get worse, even if the little fellow seems to be happy, eating well and having no problems. We sedate and treat miniatures the same way we do large horses. They are brought into our mobile dental clinic, our working area is adjusted to fit their size and they are carefully sedated. We have smaller dental equipment for their sized mouth, the training to recognize the needs and very importantly, the on board diagnostic capabilities with our x-ray and digital processor that projects the image immediately onto our computer screen. Diagnosis can be confirmed and accurate treatment judgments made while on the farm. Miniatures can be difficult to accurately diagnose and treat because of the size of their mouth and their short stature. 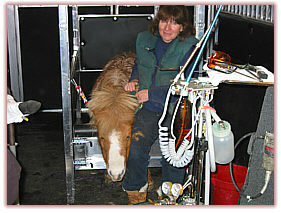 We are set up to treat minis, we have a sedation protocol that works very well and is comfortable for them. While challenging, both Kathy and I enjoy working on and with them. Copyright © 2007 Performance Equine Dentistry, Inc. P.S. All Rights Reserved.